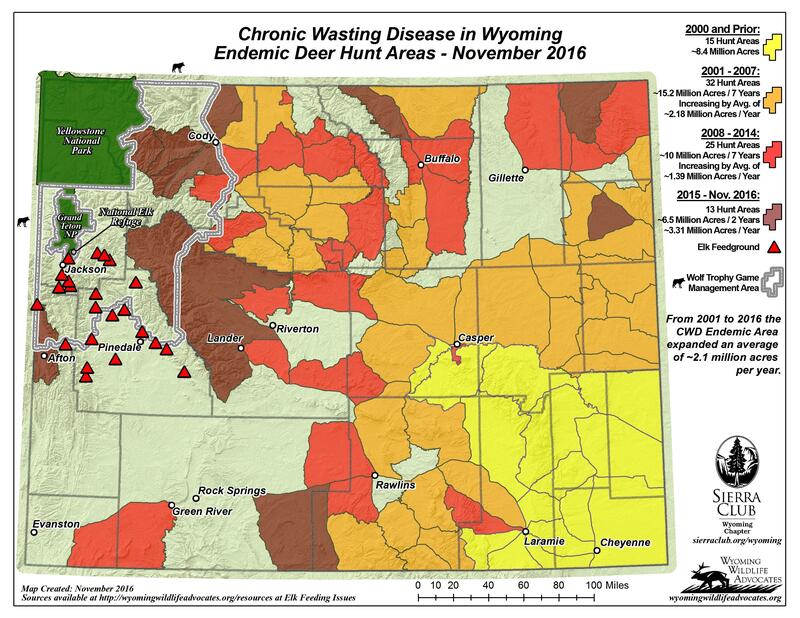 Wyoming Wildlife Advocates & Sierra Club release updated Chronic Wasting Disease map. Wyoming Wildlife Advocates & Sierra Club today released an updated version of their Chronic Wasting Disease map. Click to Enlarge, Use your browser’s back button to return. This map depicts CWD endemic mule deer hunt areas across the state of Wyoming. The different colors portray the movement of the disease over the time period of 2000 until the present and starkly shows CWD’s steady march across the state. CWD-positive hunt areas now abut Yellowstone National Park with the recent discovery of a CWD infected deer approximately 10 miles from the Park’s east entrance. Note the legend on the right: during 2015-2016 the expansion of the endemic area has increased to ~3.31 million acres per year from 1.8 million acres per year average during 2001-2014. During 2015 five (5) new CWD+ Deer Hunt Areas were designated in Wyoming; during 2016 (so far) eight (8) new CWD+ Deer Hunt Areas have been designated. From 2001-2014, the average number of new CWD+ Hunt Areas per year was four (4). The map also shows the proximity of CWD endemic hunt areas to elk feed grounds maintained by Wyoming Game and Fish Department, the National Elk Refuge and Grand Teton National Park. Also, the Gray Wolf Trophy Game Management Area is shown in order to spur a discussion about the role predators may play in mitigating this disease. The map, produced by Wyoming Wildlife Advocates and Sierra Club Wyoming Chapter, is an updated version of the CWD in Wyoming Endemic Deer Hunt Area map that we release from time to time.